It yearns for peace and harmony. It searches for trust and friendship. It yearns to be still in love. However, its heart is in turmoil, for it does not see the peace and harmony in this world. Rather, mankind has been content to engage in wars and take innocent lives, unaware of the unfortunate end that would await them. To feel pain when someone is hurt, one can be either as stiff as a stubborn boulder and stay oblivious or as adaptive as water and react quickly. For the sixty-four that are suddenly pulled from their ordinary lives, pulled from the worlds in which they live, it calls for the most adaptive candidate, the candidate that can quickly respond in a suddenly unfamiliar environment. Like the ever-changing form of water, a road to destiny can change. To accept... no... to become Aquamarine... is to adapt. For many newcomers, Aquamarine 1 is supposed to be a warm-up match, mostly to get candidates acquainted with the new system. For a handful of them, the first match does not come easy. Patchouli Knowledge, unfortunately, won't have the time to warm up. After even being considered to enter this tourney on a technicality, Patchouli and the other Touhou candidates are set for an invasion, yet three of them could have their run stopped here and now. Ichinose Kotomi is a returning sophomore of this event, and despite the fact that she was a newcomer last year, she began Aquamarine 2008 with an impressive (8-1) record, and parlayed that into an eventual sixth place finish in last year's competition. With Touhou's exceptional strength displayed in the preliminaries, Patchouli looks to do the same. It's a collision between a potentially strong newcomer and an apparent strong sophomore. Could Patchouli pull an upset, or can Kotomi try and go the distance again? Shameimaru Aya comes from a Touhou franchise that does not have an official anime despite their overwhelming popularity. However, after a fan-made Touhou anime episode allowed her to enter a Saimoe contest for the first time, Aya put up an impressive display of power. She placed fifth in the nomination standings and advanced, making her one of the potentially powerful candidates to watch for. To test that power, Aya is up against a ISML 2008 top 16 finisher right off the bat. With two consecutive Japan finishes of 5th and 2nd to go with her exceptional 13th in ISML 08, Hiiragi Tsukasa is no pushover. But as the weakest of the three Lucky Star characters in ISML, Tsukasa can be considered the borderline between characters who are merely strong and the characters who are truly powerful. If Aya and the other Touhou characters want to be successful, beating Tsukasa is an obstacle they have to overcome. Will Aya be able to show that her preliminary performance was just a taste of what was to come or will Tsukasa show the newbie what it means to be one of the elite? On paper, this contest is supposed to be a blow out. The persistent Nagato Yuki has never finished below 6th in any contest she has entered to date. Kawasumi Mai, on the other hand, had been almost non-existent in 2007, and was barely eligible for auto-entry, only to have an unexpected rush to 14th. However, to think that the favorite will defeat the underdog with style is a bit of an understatement. Despite having a plethora of quality wins last year, two of Yuki's four outright losses came at the hands of unexpected upsets from the Kanon crowd, including a 294-288 result — to Mai's favor, last year in Ruby 6. This year, Yuki's career undefeated record in Aquamarine periods is in jeopardy, but the Kanon franchise is now four years old, and memories are disappearing fast. Can Yuki finally overcome her weakness or will Mai knock her out of Aquamarine in the first set? For Mizunashi Akari, the road to ISML eligibility wasn't smooth sailing. A controversial 5183-5183 tie with Sakagami Tomoyo allowed her to move into the next round, and indirectly affected the ISML 2009 roster. For Kinomoto Sakura, the 2002 championship was just that — 2002. Despite being a legend, she struggled to retain automatic entry eligibility, barely making the 2009 roster with a (38-25) record. Both Sakura and Akari had the past four months off honing their skills, with Sakura using the Clow cards to save her hometown from mishap and Akari trying to unravel the mysteries hidden on Aqua. This will be the first meeting between the two of them, and with their supporters racking up lights all over the globe, Moscow could be in for an exciting match. Will the Sakura bloom this coming spring, or will "Aquamarine" take the first step toward Aquamarine? This Round's match descriptions were provided by minhtam1638, Team Rocket Elite, minhtam1638, and Juice respectively. Kinomoto Sakura survived a potential unknown during Aquamarine 1, being able to smooth her way into victory, but now comes yet another candidate she has never faced before. Illyasviel von Einzbern hasn't made much noise during the 2006 circuit when she competed, but this could be a breakthrough win for her. As inexperienced as she is with many of the stronger candidates in this league, she could be able to pull a potential win out of nowhere, as Sakura has lost to both Saber and Rin Tōsaka last season. This is the first occurrence of this matchup, with both candidates representing anime that have debuted before 2006, yet both of them are off to a strong start with a critical first victory. Both also have their own advantages — while Sakura may have had a full season worth of experience, Illyasviel has the element of surprise. With a (2-0) start waiting in the wings, this is one match neither can afford to lose. Which one can be able to keep her Aquamarine hopes alive? One of the major rivalries in the history of Saimoe contests is the one between Mahō Shōjo Lyrical Nanoha and Rozen Maiden, which became known after multiple occurrences of this particular matchup appeared in Saimoe Japan. However, usually these rivalries involve either Takamachi Nanoha or Fate Testarossa. Today, Yagami Hayate gets her chance to take part in that rivalry against Suigintou, one of the stronger Rozen Maiden candidates in this contest. 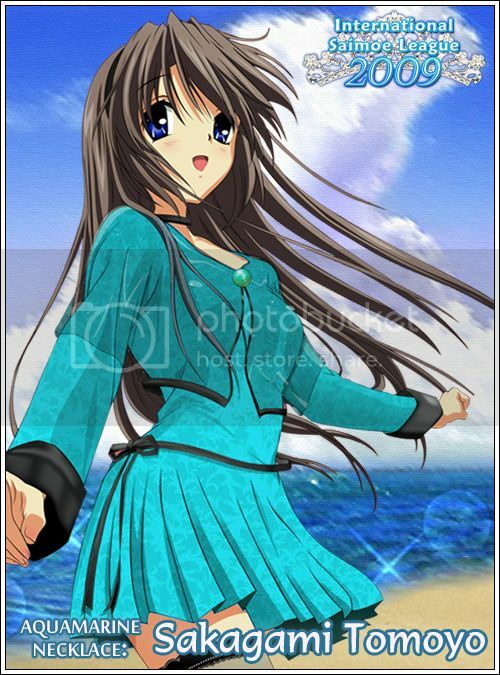 Hayate has not had much luck in Saimoe in the years this rivalry was active, but she did finish 9th Place in Saimoe Japan 2008 and looks to continue that strong run. However, Suigintou has never finished outside the top 16 since 2006, and she is currently the reigning Korea Super Best Moe champion. Both of them have a win so far, but because Hayate's first win was over her friend Vita, this is the first true test for her. Could Hayate continue her magical run or will Suigintou actually use this match as practice round for her next opponent? The three candidates from Toradora! have never competed in a Saimoe match before Aquamarine 1, but two of them seem might be getting the hang of it. For one, Kawashima Ami, a long match resulting in a close win could have her set to do well in this contest. However, any potential for her to do even better remains to be seen and will be seen in this particular match. Her opponent's credentials speak for themselves. Izumi Konata, the main character of Lucky Star, has had a successful run in the past few years, winning the Saimoe in China 2007 championship and following that with a surprising 4th place finish in last year's ISML, and her convincing win in Aquamarine 1 could be a statement to many of the top tier candidates out there. If that is the case, Ami may have her hands full with this one, but with her represented series still airing at the moment, anything is possible. Can Ami pull off a near-impossible upset, or will Konata make an even bigger statement? Coming off a close win in Mexico City, Misaka Mikoto has earned her first win in her first 1 vs. 1 match in Saimoe. With her ability to strike lightning at any opponent, she may possibly be setting herself up for a Cinderella run in Aquamarine. However, a certain roadblock in front of her may prove to be a bit of a problem. Sakagami Tomoyo may have been a candidate that has exited the 2008 tourneys rather quietly with three 7th place finishes, but she has had a number of undefeated records in necklace periods. Not only that, but she has retained the best overall record throughout the 2008 regular season. With Tomoyo?s 70+ matches compared to Mikoto?s 1, this could be a blowout, but since Tomoyo has had virtually no appearances in CLANNAD: AFTER STORY, Mikoto has the airtime advantage. Is it time that Mikoto learns her place in this contest, or could she actually hand Tomoyo her first Aquamarine loss in her career? This Round's match descriptions were provided by minhtam1638. Hiiragi Kagami always strives to be the best in just about everything, and what she has accomplished through hard work as of late is endless in number, despite the fact that Acedia Incarnis Konata is close behind (no doubt copying Kagami's homework as well). In addition to two necklaces in ISML, she won the 2008 Japanese Anime Saimoe Tournament, and so far, it seems she still hasn't reached the peak of her success. But now she faces a challenger worthy enough to have even been in the post-season tournament. 2007 Saimoe Japan champion Furude Rika's memories of her last encounter with Kagami are a little muddled up. She remembers facing her several times while in reality they have only met once, but while we may know the history, only Rika knows the Truth. However, her intuition with the divine may help in her fated encounter with the elder Hiiragi twin. It�s a battle between the two most recent champions from Japan, but with Japan virtually non-existent in this contest (so far), only the true victor will prevail. Will perseverance overcome fate or will divinity show its true power? Last year, Fujibayashi Kyō defeated Suigintou in Ruby 1 by 60 votes in a match that drew in 600, but it has been a long while since the long, winding summer. Since then, Kyō has finished runner-up to Holo in Korea Best Moe, while Suigintou defeated Suiseiseki to become the Korea Super Best Moe champion. As we close out the first week of the regular season, these two meet once more, where the winner could take another step forward at winning the Aquamarine Necklace. So far, Kyō might have the airtime advantage as the CLANNAD crowd is still going strong despite the conclusion of its AFTER STORY, but at this moment, the key could very well be momentum, and despite the fact that Rozen Maiden hasn't aired in about two to three years, Suigintou is the one riding the momentum, defeating two candidates that are a combined (2-2) in this Aquamarine Period as opposed to Kyō's (1-3). A potential candidate can be quickly eliminated from the race for the Aquamarine Necklace, but can Suigintou secure her first victory against Kyou, or will she be left heartbroken again? Los Angeles should be in for a show, as both Izumi Konata and Shana are fairly familiar with each other. Both of them met twice in last year's ISML contest. 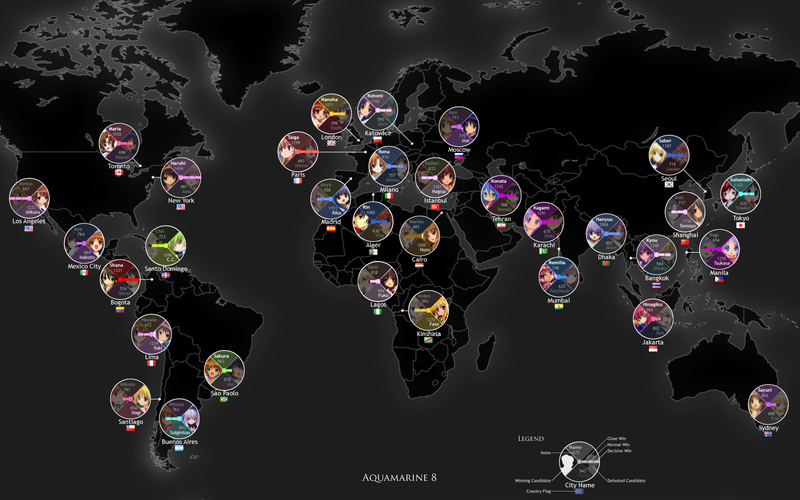 In their first encounter, Shana defeated Konata in Amethyst 5 by a considerable margin given the participation rate, but in the match that truly counted, the 2007 Chinese Champion defeated the eventual 2008 Chinese Co-Champion 656-615 in a postseason elimination match, denying Shana the heavenly tiara itself. Adding to the fact that Konata also edged Shana in the recent Korea Super Best Moe in a four-candidate match that also included Sanzen'in Nagi and Shinku, and it is certain that Shana is looking for the corner of Pay and Back. So far in the first week of the season, both candidates are fairly even, sharing most tiebreakers up to the vote differential, which is currently slight, meaning there is no clear favorite in this crucial match. The winner will take a huge step in Aquamarine by defeating a quality opponent, while the loser could be left hoping for a mathematical margin. Will Shana continue on her road to defend her Aquamarine Necklace, or will Konata have the edge against her again? These two candidates performed radically differently last year. While Suzumiya Haruhi became one of the greatest forces to be reckoned with, Furukawa Nagisa could only quietly finish the regular season in 22nd place. Compared to her friends from CLANNAD, this would be considered disappointing. Fortunately, with all of the screen time in CLANNAD: AFTER STORY to herself, Nagisa could be undergoing a popularity boost which could be the integral part of a chance to challenge the Aquamarine necklace. Yet, Haruhi also came up with her alternate appearance in a Suzumiya Haruhi-chan short anime, which, in turn, is also boosting her own popularity. Considering the (2-0) record in Aquamarine 1 and 2 on both sides, both are currently on their course of challenging Aquamarine, and we still have no idea how this match will turn out to be. Will the God once again contribute the absolute force to overwhelm her opponent? Or will it be Nagisa with her Dango force to teach the deity a lesson? This Round's match descriptions were provided by Juice, minhtam1638, minhtam1638, and Kaito_Dash respectively. Bogota is running wild, as a potentially new rivalry could possibly be born. Out of five girls voiced by Kugimiya Rie, apparently the strongest two are meeting each other for the first time this early. On one side, Shana had performed splendidly last season, challenging the Tiara only to fall short at a (59-4), (2-2) record, and her current performance can be an indicator of future dominance once again. While Shana is flawlessly topping the table at the end of Aquamarine 3, newcomer Aisaka Taiga also came up with the comparable record (3-0), lying in 11th place. Taiga might be inexperienced in her first career year, but she performed quite well in both preliminaries and in her first three regular season matches. As the only newcomer left who hasn't lost, she deserves to be looked upon as a potential dark horse. In an epic match on an Aquamarine arena, the "new girl" is challenging the defending Aquamarine wielder. Who will the spirit of Kugimiya Rie smile upon? Between Shana's Nietono-no-Shana and Taiga's wooden sword, which will come out from Colombia with Aquamarine hopes alive? Just miles away from the Big Ben, two undefeated candidates will try to knock out a threat for Aquamarine today. Saber has been in this position before. In last year's Aquamarine period, Saber came off to an outstanding (7-0) start before ultimately finishing (8-1). However, last year, Saber's strongest opponent was Asahina Mikuru, the only candidate who defeated Saber. This year, it won't even be that easy. If the tiara-bearer next week isn't enough, Saber will have to deal with Hiiragi Tsukasa, who has done what Saber hasn't � finish (9-0) in a necklace campaign. This year, both seem to be evenly matched, but so far, Saber hasn't had quite the opponent strength Tsukasa had, with a (2-7) Strength of Schedule compared to Tsukasa's (4-5). However, adding a (3-1) to the crucial strength of schedule tiebreaker can potentially boost a candidate's chances of winning the Aquamarine Necklace. Can Saber duplicate her Aquamarine run from last year, or is Tsukasa too strong for her? The vast Egyptian deserts are going to be livened up by big moe entities. Rena suffered a loss in the last round and wants to cheer up, there isn't any better way for her to do so than to take such a cute opponent as Fūko back home. But Fūko, with her out-of-nowhere starfish powers, will not give up that easily. She has a lot of henchmen who helped her get into the quarterfinals in Saimoe Japan last year. However, if we were to judge from the results of Saimoe Japan, Rena should be the favorite since she was a semifinalist in 2007. Only one problem persists, however: Japan isn't turning in their results, so we're in a different battleground. Rena and Fūko have already met on the ISML battlefield, an encounter in which Fūko won 243-221. Nevertheless, the ambitions of both girls are very high and they are definitely striving to get into the special double elimination period. Who will emerge victorious this time? Will Fūko's starfishes gain her victory, or will she be taken home by Rena and become a part of her collection of defeated enemies? The Touhou candidates were expected to be the new entity that would dethrone the top contenders before the season started. So far, all they have done is lost. Remilia Scarlet and Hakurei Reimu are the only ones clinging to a winning record at this point, but it seems that for Remilia, the sliver of chance she has at Aquamarine can go down the drain in a heartbeat. Sakagami Tomoyo has at least tied the #1 record in the cumulative standings in her entire career, and this included four necklace campaigns, all of which she has lost due to tiebreaker situations. In other words, unless she stands alone as the #1 candidate with the best record, she just doesn't lose. For Remilia, this is a chance for a Touhou candidate, let alone herself, to make a true upset in ISML history. For Tomoyo, adding a potential (2-2) to her (4-5) strength of schedule tiebreaker can move her closer to a real chance at Aquamarine. Is history waiting to be made here, or is Remilia not the right person to pull the upset? This Round's match descriptions were provided by Kaito_Dash, minhtam1638, Matteas, and minhtam1638 respectively. Last year, CLANNAD dominated the nomination standings, taking 6 of the 17 available slots and parlaying that to an impressive run, with 5 of the 6 candidates entered finishing above .500 and 3 of them placing in the top 16. This year, Touhou dominated the nomination standings and the recently implemented preliminary rounds and were expected to dominate the competition. So far, that has not happened. However, Hakurei Reimu finished in the #1 slot in the nomination standings and is currently (3-1). The good news for her is that Fujibayashi Kyō, last year's #1 nomination also suffered her first loss in the first week but parlayed that to a strong (8-1) Aquamarine finish, including a 2-vote win over eventual ISML 2008 champion Fate Testarossa. Today, Reimu will try to repeat history, this time against the defending Sapphire holder herself, who is currently undefeated so far in Aquamarine. Will a historic victory lead to a promising run in the long run, or could Reimu fall (0-2) against CLANNAD? Tomorrow, Tokyo could possibly take the opportunity to host this year's first overall #1 vs #2 matchup. However, given that both Shana and Takamachi Nanoha will be facing opponents that could possibly hurt the crucial Strength of Defeated Opponents (SDO) Tiebreaker, Sakagami Tomoyo has a chance to spoil that possibility. Assuming the correct candidates win out their matches, Tomoyo has a good chance to steal the #1 ranking from Shana. But newcomer Kamio Misuzu has been impressive so far. Despite her loss to Nanoha last Wednesday, she's performed to a solid (3-1) Aquamarine Record. With her last contest dating to 2005, of which led to a second round knockout, this is her chance to redeem herself against the toughest competition one can ever find in a contest such as this. And with Tomoyo having much more to lose than to gain, this could be a chance for a historic upset. Will Misuzu pull it off, or can Tomoyo strengthen her Aquamarine chances with yet another win? After a handful of lackluster matches, Santiago finally gets to witness a match between two strong candidates, and the two (3-1) candidates cannot be any more different. lllyasviel von Einzbern, often regarded simply as Ilya, traveled far from her native Germany to Japan to participate in the Holy Grail War, and is now battling in her first season of ISML. Despite a quiet first-round knockout in Saimoe Japan 2006, Ilya made it here through preliminaries and is off to a steady start. But while Ilya's Saimoe experience is unremarkable, Suiseiseki is largely regarded as one of the most dominant Saimoe candidates to date. As the only character to win both Japan and Korea championships, and both in 2006, Suiseiseki remains one of the most recognizable anime characters to date with her distinct heterochromia and trademark "desu" of Internet meme fame long after Rozen Maiden's airing. Now far removed from her magical year, Suiseiseki is still competitive. It's the relative redeemer against the relative legend at the midpoint of Aquamarine. The first Saimoe competition to be widely participated in is the Anime Saimoe Tournament of Japan in 2002. It was the competition that defined what moe tournaments are today, because it made clear that Saimoe is not just a poll. Instead, it is a fierce competition with much support and campaign by many from all sides. The Final Match of that history-making event was a close battle between Kinomoto Sakura and Kasuga "Ōsaka" Ayumu, in which Sakura narrowly won with 52% of the votes. Interestingly enough, this was also the last time the two were majorly involved in Saimoe tournaments. Sakura had a bit more luck, making the top 64 of Korea Best Moe in 2008, but Ōsaka practically disappeared from the radar. However, as fate would have it, the fans have once again voted to place Sakura and Ōsaka together in another Saimoe match. With almost a 7-year gap between these two "true veterans," anything could happen. Will Sakura have retained her loyal fans or could Ōsaka take revenge and turn around the final result of the first ever Saimoe tournament? This Round's match descriptions were provided by minhtam1638, minhtam1638, kevo, and KholdStare respectively. For Takamachi Nanoha, being the sixth candidate to win a necklace is the last thing on her mind. Rather, what preoccupies her is the unpleasant trip down memory lane as Shana, Aquamarine's defending candidate, is one opponent Nanoha would rather not face again. With this series (2-0) in Shana's favor, including a heartbreaking one-vote escape in Korea '07, Nanoha being the underdog comes as no surprise. Nanoha is presently the only undefeated candidate whose vote differential and total votes for are less than 1000 and 5000 respectively. On the contrary, Shana has been blowing by her opponents despite a difficult schedule. With Shana already eying another opponent to improve on the crucial tiebreaker that will decide it all, Nanoha must find the same passion that won her the 2005 Saimoe Japan championship if she is to stand against the overwhelming statistics. The large metropolis of Tokyo plays host to this prolonging rivalry: Who will continue to climb, and who will get lost on the way to the Aquamarine peak? With a 5th-place finish in ISML 2008 and an early exit in Saimoe Japan at the hands of underclassman Sakagami Tomoyo, Ichinose Kotomi has a score to settle with her silent-type counterpart from Suzumiya Haruhi no Yūutsu. Kotomi has been defeating opponents relatively easily over the past few rounds and wants to return the favor of her 30-point loss to Nagato Yuki in last year's Aquamarine Period. Yuki has also defeated most of her opponents thus far without having to break a sweat, and the ISML 2008 runner-up wishes to repeat or improve that impressive performance from last year. Will Kotomi play a sour note for her opponent, or will Yuki modify the notes to play a song of Victory? Despite an undefeated start, Katsura Hinagiku is already in trouble when it comes to winning the Aquamarine Necklace. The maximum Strength of Schedule a candidate can gain is 32 points during the 9th set, but with Hinagiku already 27 points behind Shana in this tiebreaker, it would take either a miracle or a collaborative collapse for Hinagiku to win Aquamarine. However, Hinagiku has a chance to strengthen her chances by defeating a (4-1) opponent today. Unfortunately, this opponent is not an easy walk. Hiiragi Tsukasa has met Hinagiku twice already, and although she lost both times, the most recent match between these two was decided by less than 1% of the vote. With Tsukasa's Strength of Schedule tiebreaker already higher than Hinagiku's itself, it would seem that Tsukasa could have the honor of handing the first loss to a preseason Tier 1 candidate, and if the margins continue to slide towards Tsukasa's favor, it can actually happen. Could Hinagiku possibly lose out on Aquamarine or will Tsukasa find herself yet another loss? Though quite familiar with intense, exciting competition, Milan is in for a treat this year as the defending champion, Fate Testarossa, squares off against a feisty Suiseiseki in a thrilling rematch of a Saimoe Japan 2006 bout. Suiseiseki, fresh off a tough loss to Illyasviel von Einzbern, is seeking to regain some momentum and to keep a winning record early in the tournament. Her performance so far is but a mere echo of her triumph over Fate in the final round with a 1.47% margin of victory. Fate has since redeemed this crushing loss by winning the ISML Tiara in 2008 and getting off to a torrid 5-0 start in Aquamarine. Her career winning streak currently stands at 27, dating back to Diamond 2 of last year. Despite the fact that Fate is the heavy favorite in this match, Suiseiseki has won two of their three encounters. One of the most intense rivalries in history writes its fourth chapter. Who will achieve the rightful ending? We thank matteas, Juice, minhtam1638, and kevo for their contributions to this Round's match descriptions. In ISML 2008, Saber had a reputation for jumping all over the rankings in each Period, holding strong for a few Rounds in a row but then losing many supporters in the next few. This year, she has been so far solid. Saber is not only undefeated but ranks higher than many previous favorites such as Nanoha, Kagami, Yuki, and Konata. Her next challenger comes from the rank right above her by the name of Fate Testarossa. The ISML 2008 champion is also undefeated and hopes to keep it that way, but her opponent has risen rapidly in the rankings and will be her greatest challenge yet. Will Saber upset Fate to continue climbing up the ladder, or will Fate stand her ground? For a top-16 finisher in ISML 2008, Hiiragi Tsukasa started off well but has lost two of her last three Matches to fall out of the top ranks for the first time this year. Furude Hanyū found herself in an almost opposite situation: almost missing the automatic entry cut for ISML 2009 with a 33-30 record, she now has a great season start with a 5-1 record, one rank shy of entering the top 16. With one of the highest SAO out of the 64 contestants, Tsukasa has one of the toughest schedules in Aquamarine, and it's not about to get easier with Hanyū. Will Hanyū join her friend Rika or will Tsukasa join her sister, Kagami, in the top 16? It was only one year ago since the two have last faced off; the magecraft user, Tōsaka Rin got the win by a difference of three votes during Ruby Period. Tōsaka Rin’s bouts during the Aquamarine period have ended up mostly sour, as she presently stands at 3-3, whereas Ibuki Fūko has gone onto a 5-winning streak after her season-opening loss to Fujibayashi Kyō. Will the successor of the Tōsaka family pull out all stops to win against Fūko’s hand-made starfish and prevent her fourth loss, or shall Fūko’s cute carvings overwhelm Rin this time around? Holo has been known for doing well in Saimoe tournaments ever since she entered the scene, winning Korea Best Moe 2008 in her first try and being two places shy of the top 16 in ISML 2008. Aisaka Taiga seems to be following Holo's footsteps, defeating her opponents left and right as a newcomer, establishing herself in ISML 2009's top 16 for the past five Rounds. However, Holo seems to be having a bit of trouble this year, evident by her possessing the highest SAO score. Will the wise wolf Holo bounce back and take down the palmtop tiger Taiga? This will be a heated battle that you don't want to miss! Thanks to KholdStare and Tsunamu for their contributions to this Round's match descriptions. Watarase Jun quickly gained the title of Queen King of Crossdressers in 2006, but a new character has been gaining popularity in recent seasons, threatening to label Jun as "old" news. Not amused by this, Jun sent a letter of challenge to this "other" — the dutiful Ayasaki Hayate, known sometimes as "Hermione." Hayate's reluctance to respond was overridden by his Mistress Nagi's excitement over such a spectacle, and he was soon flown off to the fabulous city of San Francisco — his suitcase filled with maid uniforms and other frilly attire. Will Hayate return with a new glorious title for the Sanzen'in estate, or will Jun's Patriot Missile kick best the combat butler? Katsura Hinagiku is undoubtedly a popular veteran. She placed first in Korea Best Moe 2007 and third in 2008. She also placed third in Saimoe Japan 2008 while making top 16 in ISML 2008. Illyasviel von Einzbern, or "Ilya," had very little Saimoe experience, making past the preliminary rounds in Saimoe Japan 2006 but then getting knocked out after the first round. ISML 2009 has proved to be very different for Ilya, as she comes into this Match with a 5-2 record despite having a tough schedule with an SAO value of 72. Hinagiku is undefeated, but she has the easiest schedule of all contestants so far with an SAO value of 39. Will Hinagiku prove that she can beat a tougher opponent, or will Ilya escape from yet another harsh battle? This will be a true battle indeed against two old friends, the Palmtop Tiger and the self-proclaimed Diet Warrior. Even though ISML 2009 is their first appearance in a Saimoe tournament, both have achieved different results. Aisaka Taiga is a solid contestant with a 6-1 record entering this Round. Kushieda Minori, however, received less popularity, only winning two matches out of her seven. But this time, "Minorin" hopes that Taiga will go easy on her. Taiga has sacrificed herself for her friend before, so maybe she will do the same here. Even though the Tiara is at stake, there are other things on these two girls' minds. Who will be more focused on the prize? No one really knows the history of the Scarlet Devil Mansion very well, but its inhabitants are very well-known. The mistress of the mansion is a vampire of approximately 500 years old by the name of Remilia Scarlet. Within the castle is a huge library where the librarian Patchouli Knowledge resides. Even though they are friends, their time to test each other's strength is now. Will Patchouli be able to summon holy light and break her losing streak, or will she cough and fumble her spell...yet again? Meanwhile Remilia hopes to hold on to a 0.500 record at the very least. You do not want to miss this mysterious battle between The Scarlet Devil and The Unmoving Great Library. Thanks to KholdStare and LazyCanuck for their contributions to this Round's match descriptions. There are no coincidences, only inevitability. The fated hour draws near for the top two candidates of Aquamarine. Shana looks to become the first candidate to defend a Necklace by reclaiming what she believes is rightfully hers. But Sakagami Tomoyo, after a thorough shutout last year and robbed of many Necklaces both directly and indirectly, would like nothing better than to outlast her rivals and claim it herself. All is fair in love and war, and these candidates understand it well. Shana's blazing eyes gaze through Tomoyo's icy exterior to find a girl ready to unleash a combo fury, and Tomoyo herself remains as cool and composed as ever — two opposite ends of the spectrum. However the color they desire is blue — aquamarine blue — and into the blue they will go for the final match. One dream, one necklace. One last match by the seashore. With the top competitors for the Aquamarine Necklace in Sydney, the showdown in Santiago has been somewhat overlooked. While Fate Testarossa has a legitimate shot at claiming the Necklace, Katsura Hinagiku will need a lot of help to come close. The passage of time gradually puts Hinagiku's Korea Best Moe 2007 title further in the past, and while her recent results this year in ISML have been all wins, they also show that Hakuou�s graceful queen may be starting to fall off the map. With Fate leading her in many of the tiebreaker categories, Hinagiku will need to shut out critics by defeating the League's defending champion, which will be an ordeal in itself as Fate tries to add a quality win to her resume in pursuit of her first Necklace. This match may rely greatly on what happens Down Under, but with two candidates focused squarely on each other, a collision course is now under way. This match could have been another bout of undefeated candidates if Ichinose Kotomi had not scored a victory over Nagato Yuki last Friday. Now Fujibayashi Kyō, also a good friend of her next opponent, is looking to preserve her chances at Aquamarine. The last time these two met, Kyō defeated Yuki in the regular season finale, eliminating the only undefeated Diamond candidate left other than Suzumiya Haruhi in the process. With the records reversed in this match, Yuki is looking to return the favor and foil Kyō's Aquamarine hopes and sparing herself from a second loss this early in the regular season. With Aquamarine coming to a close, remnants of a new rivalry are slowly coming together. Will Kyō defeat Yuki for a second time or will Yuki hand Kyō her first loss of the season? Suzumiya Haruhi has enjoyed her time in Aquamarine, winning every match thus far. She wants all the glory she can attain, and with two of last year's Necklaces already in her possession, securing Aquamarine is just one more step towards Spreading excitement all Over the world. One final obstacle stands in her way — Hiiragi Kagami. The elder Hiiragi sister was also on track to capture her third Necklace when a major upset from Furukawa Nagisa, who lost to Haruhi earlier in the period, eliminated that chance. Now she fights to maximize her opportunities at the Tiara. While Haruhi seeks to better her chances at Aquamarine, Kagami wishes to redeem last week's misstep. Who will win in the last battle of Aquamarine: the SOS Brigade Leader or the current J-Saimoe Champion? Thanks to Seishi, minhtam1638, and Juice for their contributions to this Round's match descriptions.